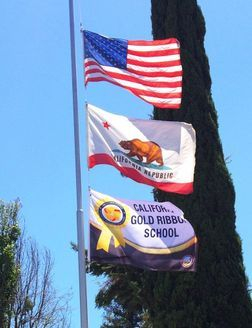 As a California Gold Ribbon School, California Distinguished School, a School for Advanced Studies, and an Affiliated Charter School, we take pride in that perception of our school. Large numbers of students and families participate in school functions that extend beyond the regular day to strengthen community and instructional programs. Our school events bring past and present staff, families, alumni and community together to celebrate our partnership with enriching experiences. Inside the school day, this collaboration is evident and supports our students. On any given day, one can see parents come in and out of classrooms, workrooms and the Parent Center. The bond between staff and families sends a message to our children that their education is important. The staff at Justice Street is dedicated to serving the needs of our students and understands the importance of addressing all facets of their education; not just the academic objectives. Our focus is on developing the whole child. This tenet is an ongoing topic at our Professional Development meetings and an essential part of our mission. Our students are integral members of our community’s culture and represent our future. Providing positive role models, explicit teaching of the Pillars of Character and social skills are fundamental to our curriculum. We recognize students for their successes and support those needing additional skills. Justice students are encouraged to develop all of their gifts such as artistic ability, academic skills, critical thinking, the performing arts, and physical prowess. Our outstanding educators and paraprofessionals are dedicated to honing their craft to ensure that students are actively engaged and taught to take ownership of their learning. As you walk around our campus, you see students immersed in the learning process and evidence of their learning is demonstrated in student created models of the human body systems, artworks depicting pointillism, poetry, written works, book collages, and the remnants of scientific experiments in our Science Lab such as the exploration of owl pellets. Students evaluate their work to identify strengths and areas of need. Providing this opportunity for self-reflection and feedback is a valuable component of the instructional program as evidenced by Marzano’s research. When students take ownership of their learning, they are able to grow to their fullest potential.